The following profiles of John Robertson Duigan and Reginald Charles Duigan are compiled mainly from letters and articles in the Duigan Family Archives, interviews with members and close friends of the family and personal observations. Reference to several well researched articles listed below, was necessary at times when documents with dates, titles and places were missing from the records. John Robertson Duigan, the eldest son of John Charles Duigan and Jane Robertson Duigan, was born in Terang, Victoria on 31st May, 1882. He was educated at Brighton Grammar School, obtaining his Matriculation Certificate in 1898. Further studies were taken at the Working Men’s College, later named the Royal Melbourne Institute of Technology. He then attended the City and Guilds of London in 1902 and the Battersea Polytechnical College, obtaining engineering certificates. He worked for the Wakefield and District Light Railway Company in 1906, before returning to Australia in 1907 to work for G. Weymouth Pty., Ltd., an engineering firm in Melbourne. Before this time, he showed no special interest in aviation. In 1908 he returned to his parent’s property, ‘Spring Plains,’ Mia Mia, which was managed by his brother Reginald. While waiting for suitable employment, with time on his hands and no interest in the land, he set about making a glider, before turning his attention to powered flight. 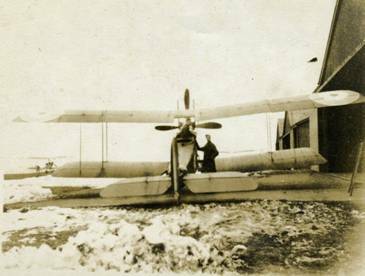 After the second plane had crashed, in 1913 and John had recovered from his injuries, it is rumored around the family that their mother, Jane, extracted a promise from her sons to ‘give up flying! John married Kathleen Rebecca Corney, a trained nurse, from Kynton, on November 26th, 1913. It is not known if he was nursed by her after sustaining his injuries. With the advent of war, however, John was, apparently, let off his promise. Perhaps Jane considered flying as the lesser of two dangers compared to enlisting in the A.I.F. 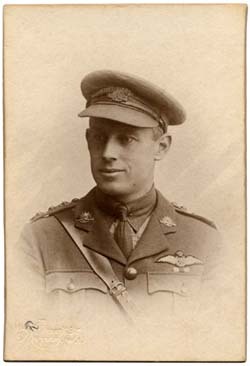 In 1916, he joined No 2 Squadron, Australian Flying Corps and was commissioned as Lieutenant. His flying certificate, marked Federation Aeronautique Internationale , Commonwealth of Australia, No 21, dated 31st May 1916, was issued by The Australian Aero Club, affiliated with the Royal Aero Club of the United Kingdom. He also had obtained an earlier flying certificate, marked Federation Aeronautique Internationale, British Aviators Certificate, No 211, issued by the committee of the Royal Aero Club of the United Kingdom, April 30tth, 1912. 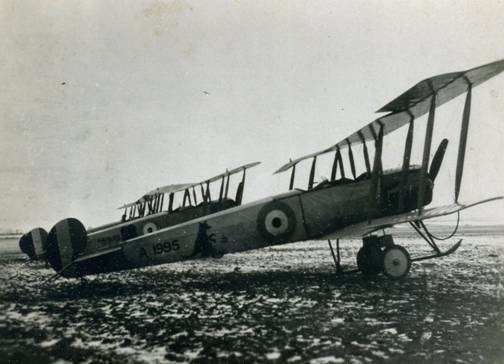 On arrival in England, in 1916, No 2 Squadron was re - numbered as No 3 Squadron, Australian Flying Corps. John was attached to No 69 squadron, Royal Flying Corps for instruction in aerial artillery, reconnaissance and photography. In August, 1917, he was promoted to Captain and Flight Commander. Kathleen followed her husband to England and worked in an honourary capacity in the Royal London Hospital. 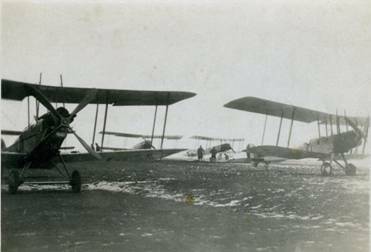 John was posted to No 3 Squadron in France in December, 1917. Small photographs in the Duigan family archives show a range of aeroplanes, most of which were flown by John. On the back of these is his writing in small letters and figures, listing – BE2Bs, which he flew at Point Cook, and BE2A, BE2B, BE2C , BE2E, BE12A, RE8, AVROS, DH4s, which he flew in England and France. The BE standing for British Experimental, the RE for Reconnniasance Experimental and DH, de Havilland. On the back of these tiny photographs he has also listed the associated type of engine, and other comments, such as a 250 Rolls Royce engine in the DH4., and a 70 Renault in the BE2B. While on reconnaissance he was attacked by four enemy scouts. Although wounded, he manoeuvred his machine with great skill, his observer using the rear gun; with the result that one scout was shot out of control. 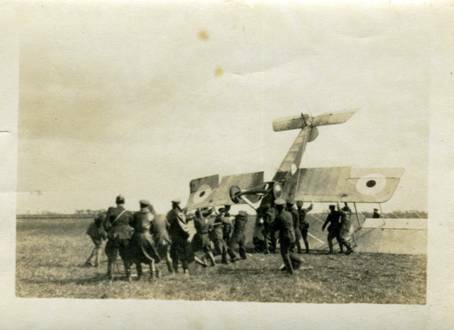 The three others continued the attack, eventually setting fire to his tail plane, after which he landed behind the front lines, helped to remove the observer, who had been wounded five times, and saved the photographic plates in spite of being wounded three times himself. Frank Gilfedder, a motor cyclist, Dispatch Rider with 3rd Squadron, Australian Flying Corp, who had taken part in the salvage and funeral arrangements of Baron Von Richthofen; was dispatched with Sgt Kirkpatrick in a V & M motor bike, with side car, to locate John’s aircraft. On locating the plane, they were ‘astonished to find the position was even more tricky than the rumours of what he could do; it was in a narrow lane between the held German trenches and some abandoned trenches on our side. A remarkable feat considering he was wounded. It was about the same spot where I went out to bring in the bodies of Capt. Ralf and Jack Buckland, shot down.’ Sgt. Kirkpatrick had told him that Jack was such a safe pilot, he could safely land a plane in the streets of London. John returned to Australia in April, 1919 and was discharged from The Australian Flying Corps in July of that year, but remained in the Reserve until he was placed on the Retired List in 1942. When war broke out again, he sold his business and returned with Kathleen to Melbourne to work with the Quality Control Branch of the R.A.A.F., Commonwealth Aircraft Corporation, at Fisherman’s Bend. There he was involved with the quality control of aircraft engine components. 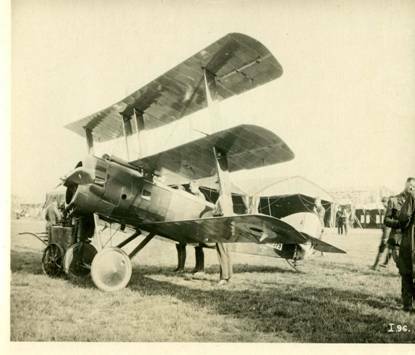 In 1920 John donated the original plane to the Science Museum of Victoria. John and Kathleen had no children and after the war, they retired to live in Ringwood, where John died on 6th June, 1951, aged 69 years. His wife, Kathleen died in November of the same year. Reg, the second son of John Charles and Jane Robertson Duigan, was born in Melbourne, 15th September, 1888. He was educated at Brighton Grammar School and also spent a year at school in Switzerland, while his parents were travelling in Europe. His fluency in French, much revered by his family, and was retained well into old age. He did not go on to any formal technical studies, as did his brother, due to the fact that he was needed to assist his father in the management of his several properties. He worked side by side with John, however, assisting him to build the Duigan aero plane and flew it on many occasions. Possibly working with his brother, stimulated his very inventive mind and in considering means of reducing drudgery on the farm, he became an adept designer and fabricator of many useful devices. For all of his adult life he continued to design and part manufacture an extensive series of mechanical inventions, at Spring Plains, until 1924 and later in Colac and Geelong. The most notable of these were, The Lock – Grip Wire Strainer, in1916 and The Plug Petrol Pourer. During world war ll, he produced small parts for the Supply Department. The move from Spring Plains included transporting the cherished lathe which had been used in the building of the aero plane and remains to this day in his son, Terry’s work shed in Geelong. Reg married Phyllis Mary Peck in May, 1914, the granddaughter of John Murray Peck, who, together with Freeman Cobb, John Lamber and James Swanton, four young Americans, foundered Cobb & Co, the famous coaching firm, which started in Victoria, on 1st January, 1854, and spread all over the five Australian states and New Zealand. A very keen tennis player, Reg often participated, with his doubles partner, Dr Doig, representing Colac, at Country Week. Even in his later years he could be seen driving off on his D.K.W. motor bike with his tennis racquets on the back. As a young man in Mia Mia, he was well known for his sporting prowess, running, jumping and tennis and also for playing the banjo at country functions. Reg and Phyllis Mary had four children, all of whom carried on the flying bug! F/O Brian Duigan M.I.D., D.F.C. Brian, the eldest, during world war ll, joined the R.A.F where he flew Wellingtons, Beauforts and Lancasters in Bomber Command and Mosquitoes in the Path Finder Squadron, among others. He brought the first Canberra out to Australia. He was awarded the M.I.D., D.F.C. and Bar, and D.F.O. Ft/L Terence Duigan M.I.D., D.F.C. Terence, B.Arch., F.R.I.A., the second son, joined the R.A.A.F. After training at Pt Cook, Victoria and Rathmines, N.S.W., he was posted to No 11 Squadron to fly Empire Boats, [Short Sunderlands] in1941, transferring to Catalinas, [PBYs] in1941. In mid 1944, he was posted to No 21 squadron to fly Liberators, [B 26’s] 1944 -45. Terry awarded the M.I.D. and D.F.C. John, too young to join his brother in the R.A.A.F. in war time, on leaving school, joined the Merchant Navy. After some years he turned to the land, first at New Gisborne and now on Flinders Island, where he flies an ultralight around the stock on his property, as he says, ‘it sure saves opening gates.’ Recently, on retirement he constructed his own light plane from a kit and flew it to Ayer’s Rock – Uluru - for his 80th birthday. Two of John’s children, Nicholas and Kate have taken to the air. Although Reg was extremely modest about his own achievements, he was very proud of his brother and his children. Any source of mistakes, broadcast or appearing in print were very hastily written to at length. In the archives there are many such letters. Reg died in July, 1966, at his home ‘Raith,’ in Geelong, aged 77 years. Phyllis Mary died in 1963. John passed away in 2014. Dr Gwynne Duigan, Archivist and Matriarch of the Duigan family, who put together the material for this website, is the wife of the late Terence Duigan. During WWll, she followed her husband up the east coast of Australia and made a home for him where ever she could, from a luxurious flat in Cairns in Northern Queensland to a covered verandah in Kilaburn Bay, near Rathmines in N.S.W. Although not an aviator herself [although she did fly a Catalina in the air for a short time!] she developed a keen interest in aviation. After the war, when Terry took up a position as an architect with Buchan. Laird & Buchan in Geelong, they lived close to Reginald and Phyllis Mary Duigan. Here, she listened to many stories of this close knit family and learned much of family history. After Terry’s death, the Duigan family archives were left in her care. Since retirement as a Radiation Oncologist, Gwynne has taken up writing. With most other members of the Duigan family, she has long been a keen supporter of The Geelong Football Club.